It’s no secret that you should be marketing and advertising your business online. I mean, look at the rest of our articles, it’s pretty clear this is the subject we like to talk about. 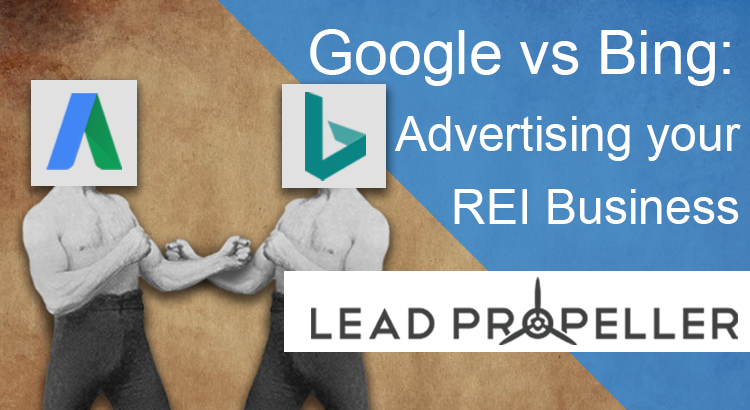 While we’ve covered paid forms of advertising in the past, one of the questions we get asked a lot is which pay per click platform is better for a real estate investor: Google vs Bing? Well, strap in, because we’re going to show you the pros and cons of both platforms in this article! Google vs Bing: What’s the Difference? So, before we get into the pros and cons of Google AdWords we have to come clean. You should definitely be advertising on both platforms. The more you advertise, the more exposure your business gets, the more leads you get, and so on and so forth. It’s just good business to be on lots of platforms. Google vs Bing is like Rocky vs Apollo, they’re both good in their own way. Which means, in reality, this article will show you how to strategize for each platform, and how to prioritize which one to use depending on what stage you’re in with your real estate investing business. Don’t worry, we’ll still do a pro/con, Google vs Bing article! We just want you to be well informed when making marketing decisions for your real estate investing business. Ok now that that’s over, let’s get started! When you think “internet” what’s the first thing that comes to mind? Most likely: Google. In fact, Mashable found that “1.1 billion people use Google search each month, making 114 billion searches“. That’s insane. If you don’t instantly think of Google when the word “internet” is said, then you’re probably not the right audience for this article. (That was a marketing joke). In all seriousness, Google is the most powerful search engine online today, so it just makes sense to be marketing on it. But are there drawbacks? Let’s take a look. Because Google is the top dog when it comes to search engines, the pros of using AdWords is inherent. Google has the power to be able to get you results of your advertisement’s performance super fast, which is perfect for gathering market information. All of these factors (and the ones not mentioned) are not only important for making the best marketing strategy for your real estate investing business, but also for knowing how your money was spent. Nobody wants to throw away money in advertisements that don’t produce revenue, which is why the quick results of Google AdWords is definitely a pro. We won’t spend too much time explaining what split testing is because we’ve covered it in detail in other articles (see our breakdown of split testing in this article). However, we will talk about how simple Google AdWords makes split testing for your real estate investing business. With split testing, you’ll be able to test a couple of things: how different ads perform, and how different audiences respond to those ads. That accompanied by the fast results of your tests, will give you the perfect formula to market to motivated sellers in your target area. Because Google AdWords is a “pay per click” form of marketing, you set your budget on what you can afford, and only spend that budget when someone clicks on your ad. If they don’t click, you don’t get charged. It’s pretty simple. Keep in mind, your budget will be determined by your market. If your real estate investing business is in a large market like Chicago, Houston, or Orlando, then your budget is going to have to be bigger to compete with other investors. If you’re in a smaller market, then you can get away with spending less. This is definitely the best pro for AdWords. You have complete control. Meaning, everything from keywords, ad groups, interests, budget, and runtime are all things that you have direct control of. You can pause your ads whenever you want, and you can turn it back on just as easily. This level of control over your paid advertisements will keep your budget in check so that you’re not overspending on keywords that don’t convert for your real estate investing business. Just like everything else, there’s another side to this AdWords coin. Because AdWords is a pay per click marketing platform, you pay for every click regardless of if they convert on your landing page or not. If you don’t have a good landing page for visitors to go to, then the click that got them there is money right out of your pocket. This is where a lot of real estate investors get into trouble when it comes to their Google AdWords campaign. 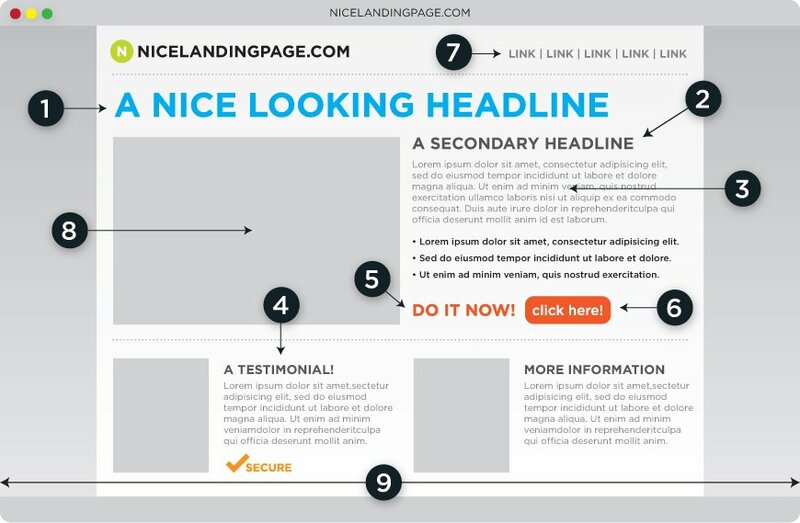 If you don’t design your landing page to be similar to your paid ad, then you’re not going to get conversions when visitors click to it. And if all of that last sentence was gibberish, then you’re in even deeper water. Don’t worry, there are plenty of good landing page builders you can find online. HubSpot has one, so does LeadPages. The best (and free) one to use is if you’re already a LeadPropeller customer, though. In your LeadPropeller dashboard, you can create and customize your landing pages in seconds with the same point and click editing style as your website. Oh, and did we mention that it’s free if you’ve already got a LeadPropeller website? It just seems like the obvious answer. If you’re not an AdWords expert, then you’re going to need to keep a close eye on your campaigns as they’re running. This can be extremely time-consuming and tedious work. Remember, you’ve got leads to find and deals to close, you shouldn’t be spending all of your time babysitting an AdWords campaign. That, and, if you forget about an ad (which is more common than you’d think) you’ll find an insane charge on your ad account. If you let it run without monitoring it for far too long, you’re going to get slapped with a huge bill. The lesson here: keep an eye on your campaign. Bing Ads – What Are They? We know that Bing exists, and we know that it’s a search engine, but what makes Bing Ads different from Google AdWords? Well, not too much. As far as building and maintaining your ad, they function basically the same way with very few differences. However, there are differences. Like we just said, Bing Ads are very similar to Google AdWords. On the back end, if you know how to set up an AdWords campaign then you’ll know how to set up a Bing Ad. As far as tracking and testing, the two are the same in that regard as well. 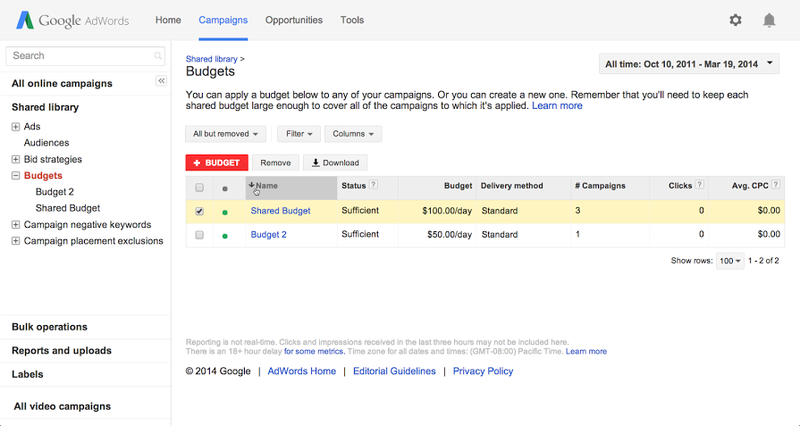 Google AdWords can start to add up in cost depending on your market. It’s also more expensive because, as we already know, Google is a much more popular search engine. Because it’s used by more competitive businesses, the bids can get pricey. That last bit of the quote, we’ll explore in the “cons” section of this article. The takeaway from this case study is that it is significantly cheaper to advertise on Bing than it is on Google. Again, this seems pretty obvious considering the usage differences in the two search engines. When you buy an ad on Google, you’ll be competing for the top 4 spots in a search result (another reason why the price can be pretty steep). Google limits the ads to the top 4 spots because they also care about organic ranking and don’t want the entire front page to just be paid links. Bing, on the other hand, is ok with having much more paid links on their front page. Where Google puts related searches, and paid spots for that, at the bottom of the page, Bing has it to the right of the exact search query results. Because Bing’s results page is laid out so differently than Google’s, paid advertisements take up more space. Where Google only gives you the top 4 results, Bing gives you 9. Meaning, if you’re buying a Bing Ad spot, you’re going to appear at the top of the search page. Just like Google AdWords, you’ll need to keep an eye on your advertisements. If you don’t spend the time to really understand how PPC works, get familiar with the platform, and maintain ad performance, then you’re going to have a bad time. Although Bing Ads are much less expensive than Google AdWords, letting a campaign run away from you can cost you well into the thousands. And no one likes throwing away money. Again, just like AdWords, you’ll need a landing page that converts motivated sellers into leads for your real estate investing business. 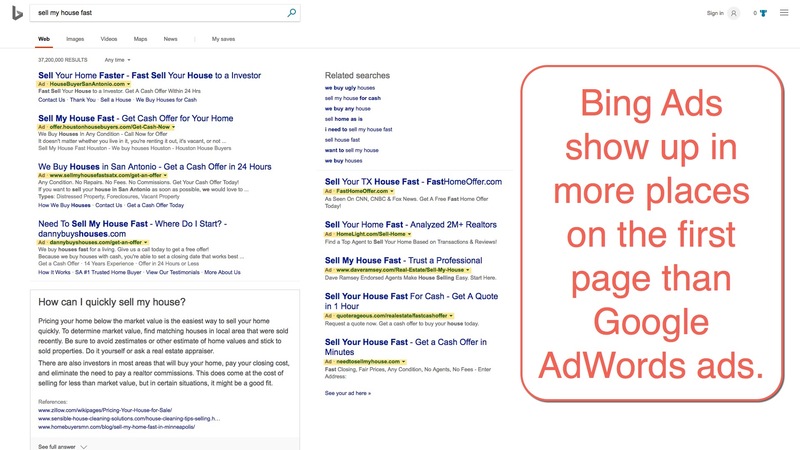 Because both Bing Ads and Google AdWords function the same way, when a visitor clicks on your link it needs to make sense with whatever your ad was. If you have an ad with a title like “Sell Your House Fast” that leads to a landing page with a title and images that don’t match, the motivated seller who went there will understandably be confused. When they’re confused, you don’t get a lead. Having a strong landing page is half of the battle. Making them isn’t difficult, just time-consuming. Remember, if you’re already a LeadPropeller customer, you can make your own landing pages in seconds at no additional cost! On the surface, that would look like Bing is a better platform to advertise on than Google. See, the problem isn’t that Bing is a bad search engine. The problem is that Google is a more well-known search engine. Consumers trust Google searches because it’s something they just inherently use and are familiar with. Google’s brand loyalty is outstanding, and the search engine usage really shows. In a 2015 study, Search Engine Land found that in a 2-month span Google got 64% of online search traffic. Comparatively, Bing and Yahoo combined only got 33%. So is Bing bad? No. It’s just not popular. When you advertise on Bing, you’re just not going to get as much exposure as you would on Google. What PPC Platform is Best for Real Estate Investors? The big question: who wins when it’s Google vs Bing for PPC advertising? Truthfully, both are good to use. Like we stated earlier in the article, it all depends on where you are with your real estate investing business. If you know pay per click marketing is where you need to be taking your business but don’t have a huge budget, then starting out with Bing Ads might be where you should go. On the other hand, if you want to get reliable leads like right now, then pushing out a little extra cash for Google AdWords is the smarter thing to do. Because Google is a much larger search engine with more active users, your ad will get in front of more motivated sellers faster. At the end of the day, though, the best online marketing strategy is to be aggressive. It shouldn’t come down to Google vs Bing because they’re both reliable platforms in their own right. The more you’re advertising, the better. The internet is a fast-paced, constantly growing, insane highway of information. If your real estate investing business needs better quality leads, then you should be blasting your business out there on every platform you can. The more exposure the better. That being said, we know that you’re already a busy real estate investor and don’t have the time to just sit in front of a computer making ads and watching campaigns. That’s why we offer a professionally managed PPC service here at LeadPropeller. 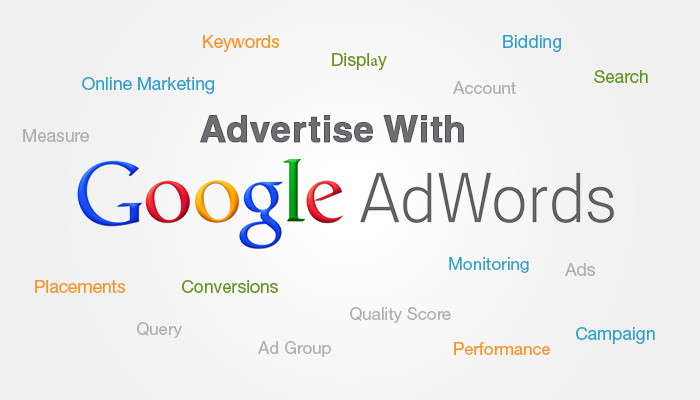 With PPC experts managing your Google and Bing ads, you don’t have to waste time researching or babysitting campaigns. The entire process is taken care of for you and is customized to your business. You set the budget, you set the area, and get a report at the end of the ad cycle so you know exactly where your leads came from and how much was spent. Online marketing really doesn’t get much easier than that! 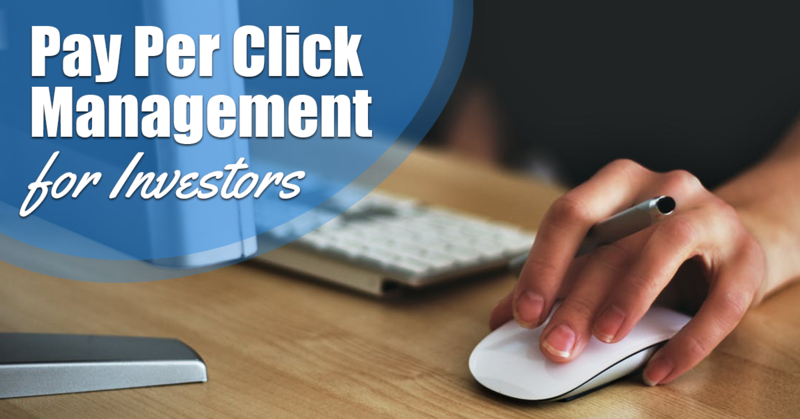 If you’re interested in a professionally managed PPC marketing service for your real estate investing business, or just want some question answered, talk to us! Our experts are more than happy to help you. Get in touch today at (210) 999 – 5187!